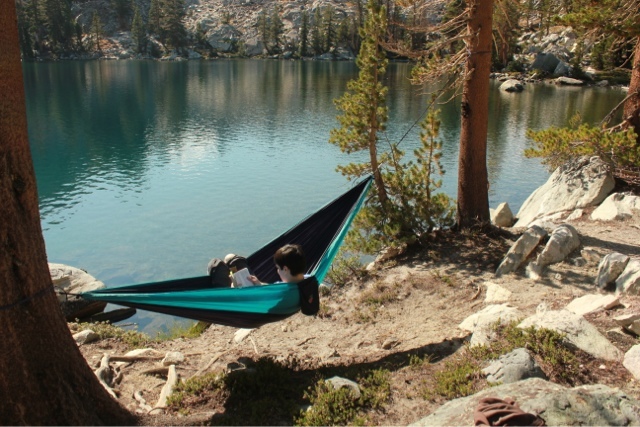 I’ve never been much interested in a backcountry hammock. For one, I’m a stomach sleeper (actually I like to flop around) and a hammock just doesn’t seem like it would be comfortable for extended sleep. 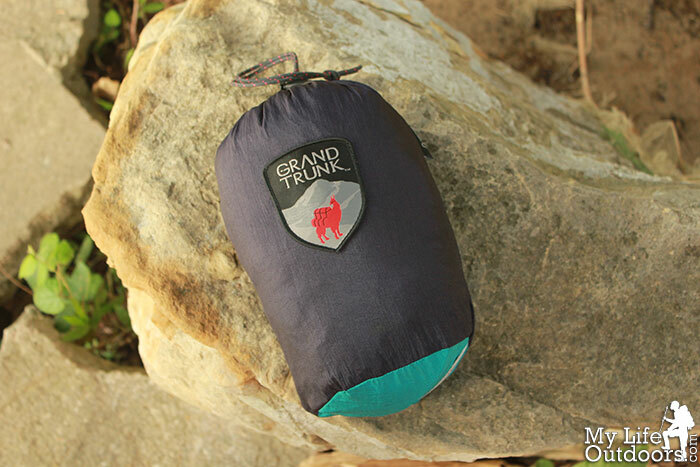 I changed my mind when Grand Trunk offered me the Grand Trunk Parachute Nylon Double Hammock. Well, my wife changed my mind for me. She convinced me to give it a try, after all that’s what reviewing is all about. When the hammock first arrived I was excited to try it out. 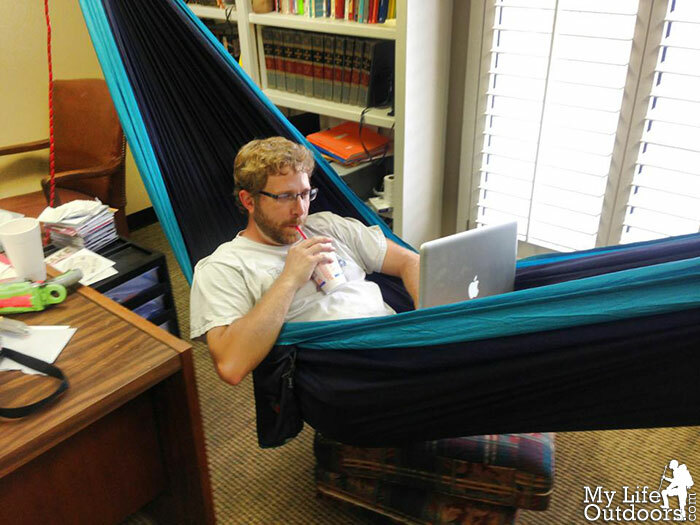 I had my new hammock shipped to my office and didn’t want to wait till I got home to experience it. I popped open a couple of celling tiles and found some nice sturdy rafters. The supplied tree slings where way too short, so I grabbed some 1/4 inch rope and quickly tied a suitable rig. I was a little uneasy to sit the first time, but it was pure heaven. I grabbed my computer and a drink and finished the rest of the days work in the hammock. It is now a permeant (and popular) fixture in my office. That is, of course, when I’m not taking it into the backcountry. I recently finished a four day backpacking trip in Yosemite NP and the Ansel Adams Wilderness. At the end of each day my wife and I would string up the hammock and have what we have affectionately come to call “Hammock Time.” After a long day on the trail sitting in the hammock was absolutely heavenly. Although we never slept overnight in the hammock, it felt good to be able to rest our sore bones on something other than a rock or the ground. The hammock is a luxury we will never backpack without. 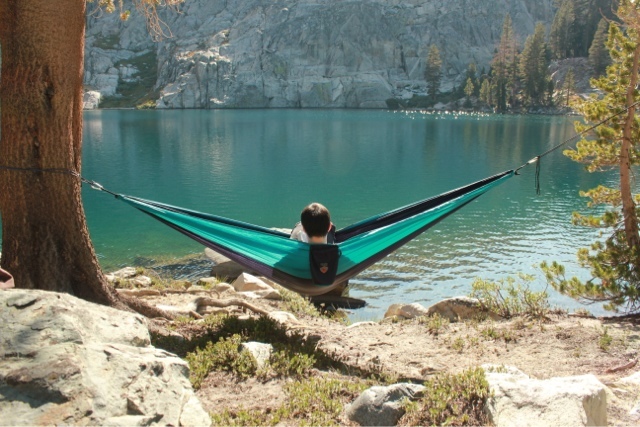 The Hammock itself is made of lightweight but strong parachute nylon. It is plenty strong to hold two people. 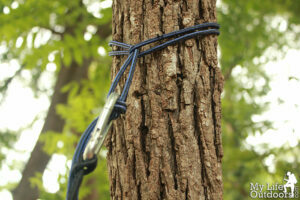 The tree slings are two looped lengths of heavy duty rope (a little thicker than paracord) about 2-3 feet long. To hang the hammock you loop a hitch knot around a tree. The other end of the sling has several knots tied into the end at diffrent lengths. You simply clip the nautical-grade steal carabiners into the desired knot and you are ready to go. The only downside (and it’s a big one) is the short length of the tree slings. You really have to find two trees at the perfect distance apart and with small enough trunks that the slings will reach around. Which, even in the middle of thick forest, is pretty difficult. Trees larger than a foot in diameter are two thick for the small treeslings. Our first night on the trail we ended up using some paracord to not only span the distance between two trees but to help the slings reach all the way around the trunks. With two of us sitting in the hammock I was pretty nervous trusting our weight to the paracord, but it held. The next night I found some thicker rope at our campsite. It was long and thick and I used it to tie a long tree sling. It was a mistake to use a rope I found on the ground. With two of us, the rope broke and threw my wife’s back against some jagged rocks. After that we didn’t use anything but the provided treeslings, which left us looking (for what seemed like hours) for two trees that would work. Needless to say it put a real damper on hammock time. To make the hammock work in the backcountry you need to carry long, sturdy, and heavy rope, which just isn’t practical. 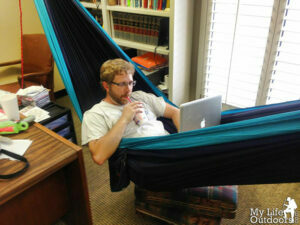 It definitely makes the hammock a real luxury choice, which may not appeal to every backpacker. Their website says the Grand Trunk Double weighs 20 oz. My scale showed 28 oz with slings and carabiners all packed inside the stuff sack. 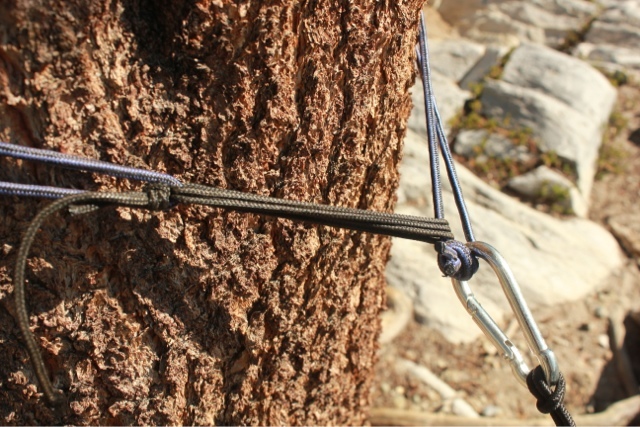 The tree slings by themselves weigh 3.6 oz together. I think some high quality aluminum carabiners would be a nice upgrade. The nautical-grade steal carabiners weighed in at 2.1 oz each. Disclosure of Material Connection: I received Grand Trunk Double Hammock for free from Grand Trunk as coordinated by Deep Creek PR an Outdoor Industry Public Relations Company in consideration for review publication.